Mars Helicopter will fly to Mars on the Mars 2020 rover mission and perform a series of flight tests over a 30-day period. Credit: NASA artist's concept. WASHINGTON — NASA announced May 11 that it will fly a small helicopter as a technology demonstration on its next Mars rover, despite concerns from some on the project that it could be a distraction. In a statement issued late May 11, the space agency said it will include the Mars Helicopter on the Mars 2020 rover mission, where it will perform a series of test flights over the course of a month. Both Bridenstine and Rep. John Culberson (R-Texas), chairman of the appropriations subcommittee that funds NASA, highlighted the fact that, if successful, Mars Helicopter will be the first heavier-than-air vehicle to fly on another world. “This exciting and visionary achievement will inspire young people all over the United States to become scientists and engineers, paving the way for even greater discoveries in the future,” Culberson said. Mars Helicopter weighs about 1.8 kilograms and has a cubical fuselage similar in size to a softball. It will be attached to the belly pan of the Mars 2020 rover and placed on the surface upon finding a suitable site after the rover’s February 2021 landing. The rover will then drive a safe distance from the helicopter before flight tests begin. Up to five flights are planned over the 30-day test campaign, starting with a flight where the helicopter will ascent to an altitude of three meters and hover for 30 seconds. Later flights will last up to 90 seconds and travel as far as a few hundred meters. The helicopter will recharge its lithium-ion batteries between flights with solar cells. The helicopter faces a number of technical challenges, including being able to generate lift in atmospheric densities equivalent to an altitude of 30 kilometers on Earth, more than double the altitude record for a conventional helicopter. “To make it fly at that low atmospheric density, we had to scrutinize everything, make it as light as possible while being as strong and as powerful as it can possibly be,” said Mimi Aung, Mars Helicopter project manager at the Jet Propulsion Laboratory, in the statement. The helicopters blades will rotate at up to 3,000 revolutions per minute, 10 times the rate of a terrestrial helicopter. Mars Helicopter will also have to be able to fly autonomously, given the long communications lag with the Earth. “We have an autonomous capability that will be able to receive and interpret commands from the ground, and then fly the mission on its own,” Aung said. 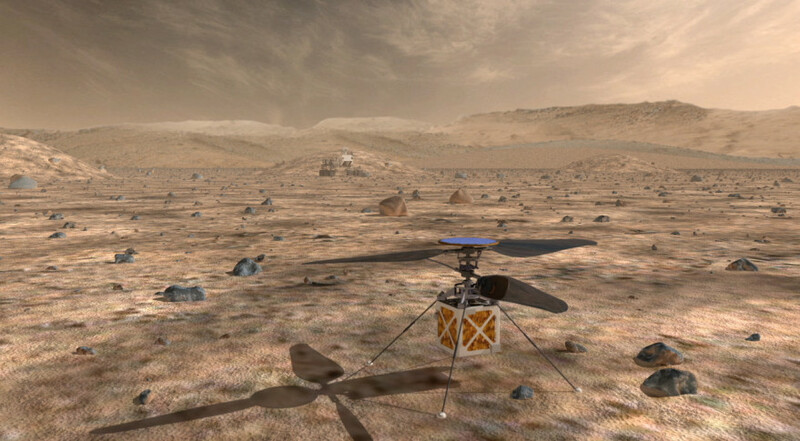 NASA sees Mars Helicopter as demonstrating the ability of such vehicles to serve as scouts for future rover missions. That could be useful, for example, for later missions to help spot samples cached by Mars 2020 in order to collect them for return to Earth. The potential addition of Mars Helicopter, though, has not necessarily been warmly accepted by the main Mars 2020 mission. At a meeting of the National Academies’ Space Studies Board May 3, Ken Farley, project scientist for Mars 2020, said he and others on the mission had concerns about flying that technology demonstration. “I am not an advocate for the helicopter, and I don’t believe the Mars 2020 project has been an advocate for the helicopter,” he said at the meeting. The major issue, he said, was that adding Mars Helicopter could disrupt science operations of the main rover during that 30-day test period even as the mission was working to find efficiencies elsewhere to maximize its overall performance.